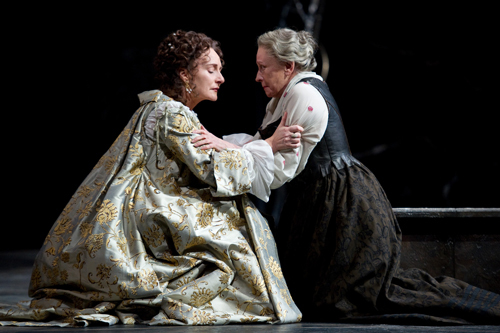 Phèdre (Seana McKenna, left) tries to find the courage to share her secret with her nurse Oenone (Roberta Maxwell). Photo by Erik Tomasson. I have been strangely drawn to the story of Phedre (or Phaedra, as she is spelled in Greek) for a long time. The tale of the ancient queen who comes to spectacular ruin – dragging a whole lot of others with her – as a result of her unruly passion has resonated strongly ever since I saw the old movie with Melina Mercouri as Phaedra, Raf Vallone as her husband and a very young Anthony Perkins as Hippolytus. Heaven knows why, since I never have lusted after either of my stepsons nor did I have any decades ago when I saw the film. Nevertheless it was with great anticipation that I braved San Francisco’s winter storms for the world premiere of “Phedre” in a new translation by Timberlake Wertenbaker at American Conservatory Theater (ACT). A co-production with Canada’s Stratford Festival, it featured a cast of seasoned Shakespeareans from across the border, under the direction of ACT artistic head Carey Perloff. What could be bad? As it turned out, quite a bit. First, the good news. The great French playwright, Jean Racine, took the story of his 1677 tragedy from a variety of ancient sources: Sophocles, Euripedes, Virgil and Plutarch. He re-fashioned his source material into a gripping, if moralizing, vehicle for some of the greatest actresses of his and subsequent times. Stratford’s Seana McKenna is the latest in that long, distinguished line, her Phedre a complicated, conflicted creature who never quite loses the dignity of a queen. Wertenbaker’s translation turns some (but not all) of Racine’s antiquated dialogue into modern, idiomatic speech. The set, by Christina Poddubiuk, is arresting: a forest of dark, menacing columns, interlaced with stringy twisting veins. David Lang’s music, used sparingly, sets an ominous tone and most of the actors are very, very good. But Roberta Maxwell’s interpretation of Oenone, Phedre’s devoted nurse who truly seems to be the villain of the piece – at least in a mortal sense because the gods have a lot to do with it as well – is so over-the-top that a number of her lines provoked laughter in the audience. Some of the ugliest headgear ever to be seen on a stage (costumes also by Poddubiuk) didn’t help. This is a tragedy, folks, and giggles – even nervous ones – are jarringly out of place. Oenone is a meddler. When Phedre, whom she has nursed since childhood, falls deathly ill of her illicit passion for her young too-virtuous-to-be-true stepson Hippolytus (Jonathan Goad) and threatens suicide, the old woman talks her out of it. It is Oenone who, acting on a rumor that Phedre’s husband is dead, convinces her to declare her love to Hippolytus and forge an advantageous political alliance into the bargain. And, when Theseus, the husband, (a very good Tom McCamus) turns up alive, it is Oenone who bears the false tale that will ultimately cost Hippolytus his life. Maxwell and director Perloff could have made more of this pivotal character than a figure of fun. There also was inappropriate laughter at other junctures, sometimes prompted by a line delivered by Phedre, sometimes by the uptight Hippolytus. Perhaps, at the end of the day, it could be chalked up to the audience. Maybe tragedy is taken more seriously in Canada than fun-loving San Francisco. Laughter ceases upon the entrance of Theseus. McCamus invests the legendary hero-king with such dignity and humanity that he demands serious attention. Sean Arbuckle is similarly commanding as Theramene, Hippolytus’ devoted tutor and confidante and it is with his long speech describing his master’s death that Wertenbaker’s poetry comes most vividly alive. Claire Lautier also is excellent as the feisty political prisoner, Aricie, who loves and is beloved of Hippolytus. This is not your usual love triangle but more of a rectangle. Theseus loves Phedre, she loves Hippolytus and he, in turn loves Aricie. No wonder it all turns out so badly. But the play is called “Phedre” after all and, when McKenna is on the stage, she owns it. Regal, tormented, her desire and her shame at constant war within her, she wishes only for death. When it comes, at last, she is utterly alone. Her nurse has thrown herself into the sea. That same sea has spewed out a monstrous end for Hippolytus. Phedre poisons herself but, before she dies, she tells her husband that Hippolytus did not seek to seduce his stepmother, quite the other way around. Disgusted and grieving, Theseus turns his back on her and walks away as she goes into her death throes. And that’s tragedy.